This month my Lily has been treated to a gorgeous new pair of sandals to enjoy. 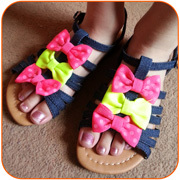 The Walkright girls denim strappy sandal with bows are delightful. They're super bright and full of personality just like Lily, she adores them. They're so low priced for the high quality you get at just £9.99. Lily's been running round in them for weeks now and they still look like new. They're practical for everyday wear with their flat soles but also suitable for parties or days out with their pretty bows and lovely bright colours. They get a fab thumbs up and a well deserved 5/5 from both Lily and I. Love Shoe Zone? Then check out all the other Shoe Zone Mummy reviews too. We've Got The Chill Factor!